How To Register On icicibankpay ? To avail benefits under the Offer, the user shall be required to register on icicibankpay during the Offer Period from August 10, 2015 and ends August 31, 2015. Anybody who registers on ICICI Bank’s Twitter Banking Application – icicibankpay gets a Flipkart voucher worth Rs.100. The Offer is valid only for select set of icicibankpay User(s) selected at the sole discretion of ICICI Bank and who have received communication about the Offer from ICICI Bank, during the Offer Period. 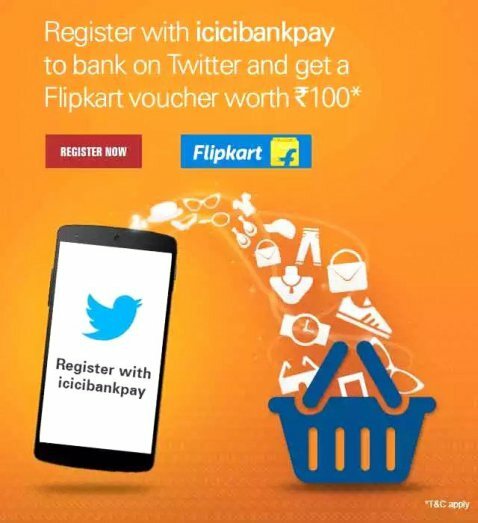 Participation in the Offer by the icicibankpay User(s) is on a voluntary basis. The icicibankpay User(s) may avail the Offer during the Offer Period or until the stock lasts, whichever is earlier.